This chapter gives an overview where TSconfig is set, how it can be edited, and the load order of the different variants. TSconfig can be used in page, it is then referred to as "Page TSconfig", or for backend users and backend user groups, in which case it is known as "User TSconfig". While the objects, properties and conditions are different, the syntax of TSconfig is basically the same as it is for TypoScript in frontend TypoScript templates, except for constants, which are not available in TSconfig. There are two ways to attach Page TSconfig to any given page. When editing a page, move to the "Resources" tab. The first way is to include a TSconfig file provided by an extension. The second is to directly enter code in the "Page TSConfig" field. It means that we want to fully hide the "sys_template" table on the page where we defined this TSconfig and all of its child pages. Page TSconfig is thus very convenient to have separate branches of the page tree behave differently. The full Page TSconfig for any given page can be viewed using the WEB > Info module and choosing the "Page TSconfig" action. Properties, which are set in Page TSconfig, are valid for the page, on which they are set, and for all pages hierarchically below. You can overwrite and modify them in the Page TSconfig of the same page or a subpage. Page TSconfig itself can be overwritten in User TSconfig. You get the value "bold". Finally you get the value "bold,italic". Page TSconfig is designed to be individual for branches of the page tree. However it can be very handy to set global values that will be initialized from the root of the tree. There is a global TYPO3_CONF_VARS value called $GLOBALS['TYPO3_CONF_VARS']['BE']['defaultPageTSconfig']. The API function above adds content to that array. The array value itself however should not be changed or set directly within LocalConfiguration.php. Instead, it is good practice to use the above API method to add your default Page TSconfig for instance within your project extension that contains other local settings like templates, frontend TypoScript and so on. The included files from the pages in the rootline are included after the default page TSconfig and before the normal TSconfig from the pages in the rootline. User TSconfig is entered in the "TSconfig" field of either BE users or BE user groups records. For both, this field is located in the "Options" tab. There is no way to view User TSconfig in the backend directly. TSconfig defined at user-level is considered more relevant than TSconfig defined at group-level. Thus if the same property is defined both for a group the user belongs to and for the user itself, the value defined for the user will prevail. If a user is member of several groups, the TSconfig from each group will simply be accumulated, identical properties from later groups taking precedence over definitions from earlier groups. 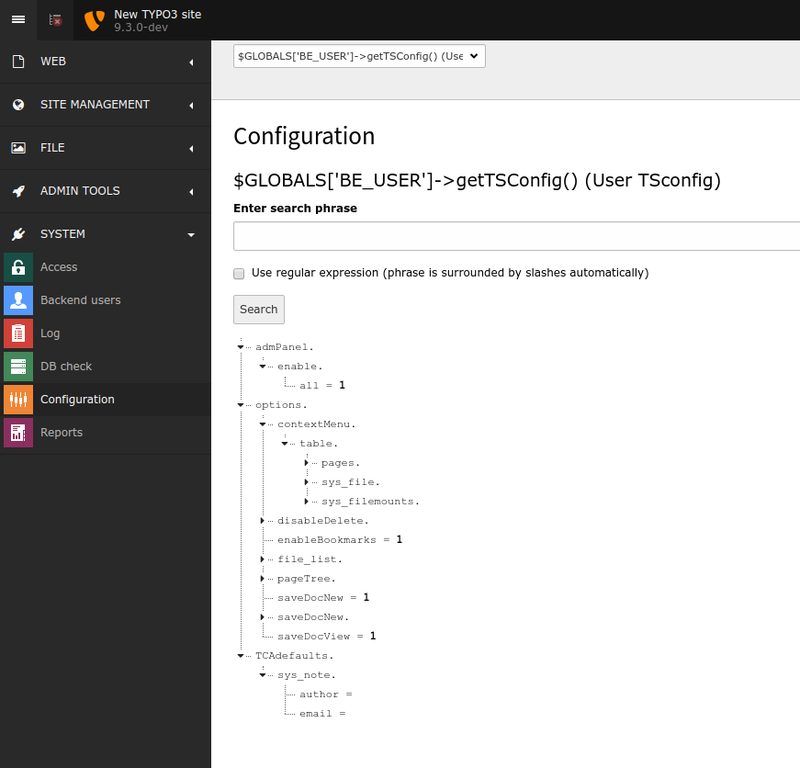 The full User TSconfig of the currently logged in backend user can be viewed using the SYSTEM > Configuration module and choosing the "User TSconfig" action. Properties, which are set in the TSconfig field of a group, are valid for all users of that group. Values, which are set in one group, can be overwritten and modified in the same or another group. If a user is member of multiple groups, the TSconfig settings are evaluated in the order, in which the groups are included in the user account: When you are editing the backend user, the selected groups are evaluated from top to bottom. You get the value "bold,italic". Finally you can overwrite or modify settings from groups, of which your user is a member, in the User TSconfig field of that user himself. 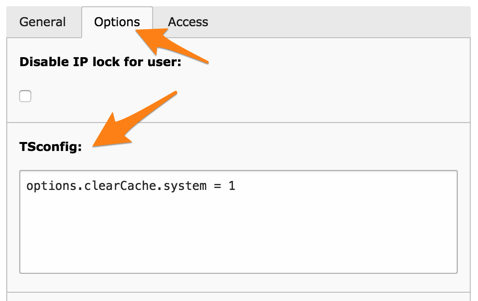 This would override the default value of the header ("234") and add the clear cache option. The default value of the hidden field is not changed and simply inherited directly from the group. All properties from Page TSconfig can be overwritten in User TSconfig by prepending the property name with page.. When a Page TSconfig property is set in User TSconfig that way, no matter, if in the TSconfig field of a group or a user, it overwrites the value of the according Page TSconfig property. It is not possible to reference the value of a property from Page TSconfig and to modify this value in User TSconfig! If you set a property in User TSconfig, which already had been set in Page TSconfig, then the value from Page TSconfig will be overwritten. The result of the example below is not the value "bold,italic", but the value "italic". User TSconfig is designed to be individual for users or groups of users. However it can be very handy to set global values that will be initialized for all users. In extensions this is easily done by the extension API function, \TYPO3\CMS\Core\Utility\ExtensionManagementUtility::addUserTSConfig(). In the ext_localconf.php file of your extension you can call it like this to set a default configuration. There is a global TYPO3_CONF_VARS value called $GLOBALS['TYPO3_CONF_VARS']['BE']['defaultUserTSconfig']. The API function above adds content to that array. The array value itself however should not be changed or set directly within LocalConfiguration.php. Instead, it is good practice to use the above API method to add your default User TSconfig for instance within your project extension that contains other local settings like templates, frontend TypoScript and so on. It is possible to use TypoScript conditions in both User TSconfig and Page TSconfig, just as it is done in TypoScript for templates. For a general discussion about TypoScript conditions, please refer to TypoScript Syntax Study of the core API document. For a list of available conditions, please refer to the TypoScript Reference. 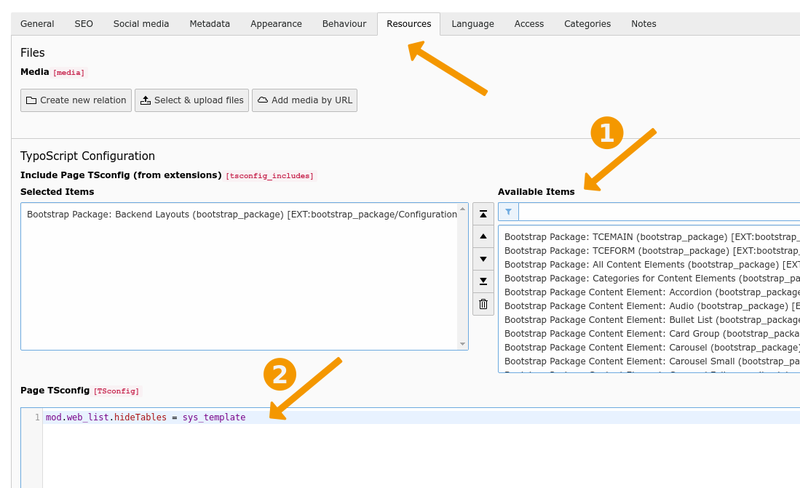 The above TSconfig will hide the "section_frame" field of content elements only on the first level of the page tree. Conditions "usergroup" and "loginUser" apply to BE groups and BE users – respectively – and not to FE groups and FE users, quite obviously. In the "globalString" condition, key "TSFE:" will not work because the TSFE global object only exists in the FE context. The "LIT:" key will not work either as it is used to compare TypoScript constants, which are not available in the BE context. Note that conditions such as "PIDupinRootline" or "treeLevel" will apply correctly to pages that are being created but are not yet saved. Checks whether the current BE user has admin rights or not. Value is 1 if the user is an admin, 0 if he is not. The following condition will apply only if the BE user is an admin. There is one method each, both just return the entire TSconfig array. All the heavy lifting and merging is done, for instance overrides of page TSconfig by user TSconfig are already applied if retrieving the page Tsconfig for a given page id. Similar to other TypoScript related API methods, properties that contain sub properties return their sub properties using the property name with a trailing dot, while a single property is accessible by the property name itself. The example below gives more insight on this. If accessing TSconfig arrays, the PHP null coalescence operator ?? is almost always useful: TSconfig options may or not be set, accessing not existing array keys in PHP would thus raise PHP notice level warnings. Combining the array access with a fallback using ?? helps accessing these optional array structures.